Christmas in Bavaria is like a fairytale, the twinkling lights of Christmas fairs, the smell of roasting sausages and of course, steins overflowing with beer. 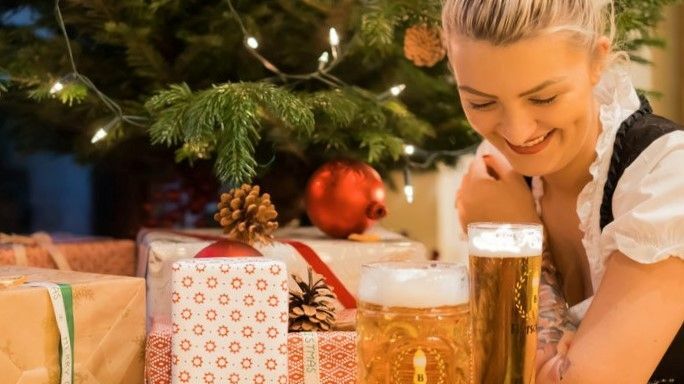 So if you've been dreaming of a Weiss(bier) Christmas then there's no need to travel to Munich when you can experience the sounds, tastes, and unique atmosphere of Bavaria right here in London. Opened in 2010, Bierschenke is London's only authentic Munich Beerhall. They are dedicated to providing the ultimate Munich and Octoberfest experience as soon as you step through the doors through everything from the atmosphere, food, drink, and music. In other words, everything you could ever want for the ultimate Christmas Party. Bierschenke offers an unrivalled selection of German beers. To ensure authenticity, they partnered with Harald, the Braumeister at Müllerbräu, a family-owned craft brewery (established in 1768) to create four signature beers. Those beers are exclusive to Bierschenke only and truly capture the essence of German beer as they serve them in traditional steins. The food at Bierachenke is a traditional selection of German classics. They offer a wide selection of various dishes including schnitzel, wurst, and the fan-favorite pretzels. To reflect the diversity of modern Germany, they also offer delicious menu alternatives for vegetarians and vegans. Bierschenke provides the perfect venue for a Office Christmas . With two floors and a capacity of 450, it can perfect for large office parties. However, its flexible and unique layout is designed to create space for events of all sizes including birthday parties and a fun private dining setting with an extensive range of catering options to celebrate with. The middle area at Bierschenke is ideal for smaller private hires. It can be hired exclusively for dining groups of up to 40 plus some additional standing space. Perfect for after work drinks, Hen and Stag parties, as well as corporate team building events looking for an authentic German setting. The back area of Bierschenke is perfect for parties of up to 110 people dining with some additional standing space. It can also be rented in conjunction with the middle area to fit 150 guests comfortably. The option to rent out the entire space is a great option for larger gatherings such as a summer party as it can hold 450 people for receptions and 300 for dining. The beer hall is also equipped with large HDTV screens, an area for a DJ setup or background music of your choice, as well as a live German band available for hire to give your event the ideal atmosphere you're looking for. Experience the authenticity in the heart of Bierschenke and their staff dressed in traditional Lederhosen and Dirndl, accompanied by the available for hire live Oompah band. Come to enjoy good beer, home-cooked German classics and the friendly atmosphere that comes naturally from sharing long tables with friends, old and new, in true German fashion. The perfect Christmas is just a glass of Glühwein away. Contact our Venue Experts to book Bierschenke for your next event. Prost!